Learn how to set up and activate your Shaw digital box. Know what to expect when the installation goes well, and what to do if activation fails. Personal video recorders (PVR) or Gateway products are not supported with Business TV plans. Contact a Shaw Business representative if you have any questions. You can activate your HD digital box yourself by following the instructions provided. Remove your new digital box from its package and write down the serial number located on the back of the box. You'll need the serial number to activate your equipment. Connect the coaxial cable (screw-on) as shown in the diagram below. Connect one end of the cable to the Shaw wall outlet, and one end to the 'Cable In' port on the back of your HD digital box. Connect the HDMI cable that comes with your HD digital box from the back of the box to an HDMI port on the back of your TV. 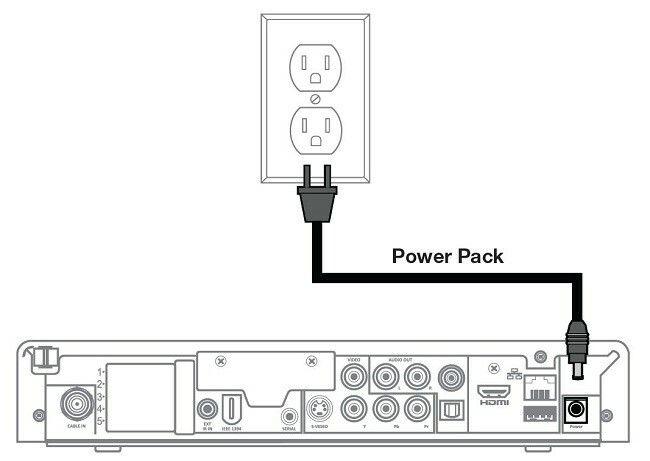 Connect the supplied power cable to the wall outlet and to the back of your HD digital box as shown in the diagram below. Serial number: Found on the back of your digital box and labelled as Host SN or printed below a bar code. Account number: You can find your Shaw Business account number on the top-left corner of your monthly bill. It is 11 digits long and starts with a zero. Confirm that the box has been installed according to the directions listed above and then click YES. Proceed to STEP: 3 and enter your location, account number, and the serial number from the HD digital box. Click the Activate Now button as shown below. The activation process takes some time to complete. What happens after activating the digital box? After activation, your HD digital box displays a TV picture and begins loading the guide information. A series of downloads from the Shaw system are needed to complete the setup. These downloads happen automatically and may cause the picture to freeze and display a series of numbers on the front panel of the box. The entire HD digital box setup process takes up to 30 minutes. Then the box will power off and power on again and return the picture to your TV. Please do not manually turn the digital box power off and on during this time so you don’t interrupt these final stages of the setup process. Once ready to use, the activated box will show the current time on the front display. Press the power button to watch TV. Contact Business Technical Support if your digital box does not work properly after you have followed all of the steps listed. We will try to activate your digital box over the phone, but a professional installation may be required.